Voe sobre Hoover Dam, Lake Mead e o Rio Colorado nesta emocionante excursão de helicóptero pelo Grand Canyon! Decolando do heliporto de Las Vegas, admire as incríveis vistas aéreas do Grand Canyon a bordo de um confortável e moderníssimo helicóptero. No retorno, faça um voo baixo pela deslumbrante Las Vegas Strip. Esta excursão de helicóptero é preciosa e a maneira perfeita de ver os destaques do Grand Canyon se seu tempo for limitado. Aviso: o embarque e o desembarque no hotel não estão incluídos. A great experience! The pilot was very knowledgable and answered any questions. It was amazing to see the Grand Canyon and the Colorado River from the helicopter! A very different experience than seeing it from the ground. We loved the small size of the group as that made it more comfortable and interactive. We've recommended this tour to all of our friends. Fantastic, a trip of a life time expensive thought! If you've never been in a helicopter before, this is absolutely the way to experience it for the first time. If you have been in a helicopter before, this seems kind of expensive for what you get. Most incredible experience I have had in a long time. Everything was perfect, from take-off to landing. There is literally no bad seat in the helicopter, the ride was super smooth and the pilot, Sam, was fantastic. We left a little later than expected only because Sam wanted us to catch the sun setting on the way back. Which we did, and the view of the whole tour was amazing. I highly recommend doing this tour. Our experience was wonderful. Very informative, Our pilot, Cody, could not have been nicer and gave us a great tour. I would recommend this trip to anyone. I would recommend going for the trip where you can stop in the canyon and get a better feel for it - it was also difficult to see in the back seats so ask for the front seats if you can. Well organised, professional and informative. This helicopter flight with Sundance Helicopters should not be missed. The staff went out of their way to help us. The staff were polite and efficient. The pilot was friendly informative and extremely professional. We felt very save. An experience of a life time. 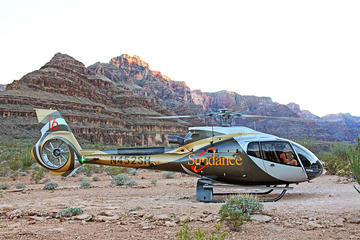 Don't miss Sundance helicopters.